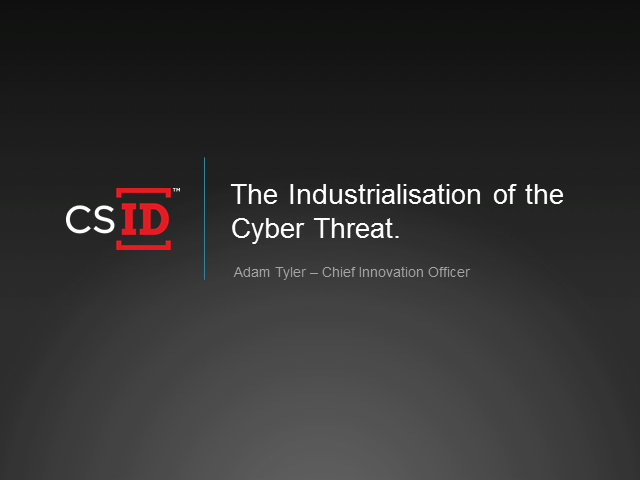 In the last decade, cybercrime has industrialised. It’s no longer the preserve of a small number of skilled hackers. The webinar will focus on the industrialisation of cybercrime and will highlight how fraud, particularly identity fraud, is on the rise in the UK. Tools for carrying out sophisticated cyber-attacks are now cheap, mass-produced, and easily accessible. Hacking communities, discussion groups and online walkthroughs are plentiful and easy to find. The raw material for crime - personal information - is available at low cost and neatly packaged for resale in online marketplaces. It really is possible for anyone, aged 8 to 80, to get involved if they want to. Andy will warn that as more services move online, the opportunities for abusing stolen personal data increase. He will stress the need for greater communication and partnership between major fraud targets - financial institutions, utility companies, online retailers and the like - which can make the UK provide a strong stance against fraudsters and help to win the battle against cybercrime. The webinar will cover and consider the evolving circumstances of data breach; the link between breaches and identity fraud; and the risks for those whose data is appropriated. Andy will explain why the response to data theft is currently inadequate; and identify some measures which could provide consumers with greater security and peace of mind, as well as the potential business benefits of doing so.